Equipment is divided into White, Green, Blue, Purple, Golden, and Red quality levels in Xeno Quest. 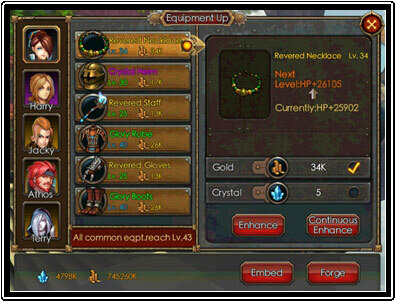 To obtain more advanced equipment, players can synthesize the lower level equipment together with the sketches and materials. This synthesis will lower the Enhancement Level of equipment by 5 levels. Synthesizing equipment can greatly boost attributes. The equipment enhancement and synthesis are very important in Xeno Quest. Advanced equipment means greater power obtained and more challenges available. To have more fun in the game, Xeno Quest has updated the concept of “success rate” with equipment enhancement and synthesis in a traditional MMO. Instead, all enhancement and synthesis have higher success rates. Of course, if you are able to afford it, you can also choose Gold to increase the success rate to 100%, eliminating the risk. Sketch mode is used for synthesis in the game. When you have equipment and a sketch of the precious level equipment, you will find a hammer icon in the character’s equipping window. This means the equipment can be synthesized with other materials and its quality can be improved.